Blockchain technology in healthcare has the potential to revolutionize the industry. Although its direct impact in medicine and surgery is not than relevant being primarily an IT mechanism, it will proffer substantial change in the use of internet in healthcare management today. Especially, the concept of shared databases will undergo massive revamp in terms of the supporting technology behind it. In current IT landscape of Healthcare industry, ERP, CRM, shared databases, as well as devices, have been playing crucial roles. Integrating blockchain technology into the existing IT ecosystem in this sector could solve several major lacunas. These are ‘shared-systems’ where each and every user participate equally in terms of information sharing. This technology is built on the internet infrastructure as ledgers or blocks associated with each user. Each block is accessed via a node, which is nothing but the interface for the users to access their own ledgers. This node could be a device or a DApp installed in the device. Such a system can effectively integrate with any Electronic Health Record (EHR) system or can even replace them. What could blockchain technology in healthcare solve? 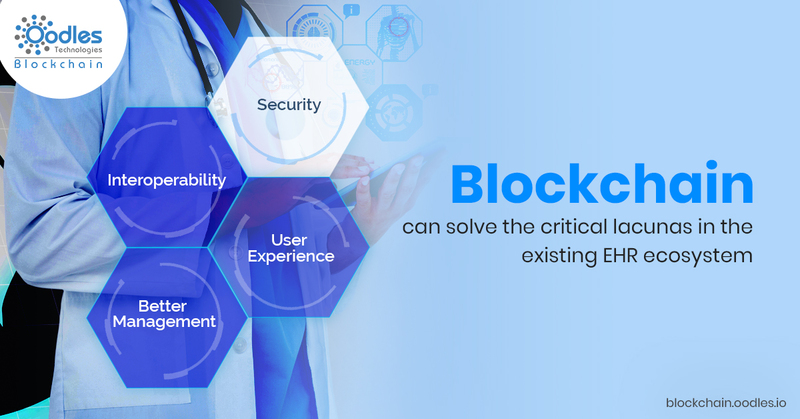 Practically, blockchain technology in healthcare can solve the critical lacunas in the existing EHR ecosystem. Interoperability, security and hectic management, as well as user experience, are found as the major issues in EHR systems. A shared, simple and transparent mechanism, which is secured enough can eradicate these issues completely. Blockchain technology, in this regard, can be developed as a panacea. David Ratto, critical care specialist from Southern California, the US, lack of interoperability is a major challenge in EHRs. He says “data must be available and needs to be seamlessly transferred from one source to the next.” He wants all vendors as well as participants in the EHR to meet interoperability standards. Apparently, EHRs are not able to meet the demands of the industry in technical fronts. The issue exists because of differences in data type and their incompatibility throughout the access nodes of the EHR. There is a technical bottleneck in EHR, as they are basically platforms built on general technology similar to databases and ERPs. The technology is unscalable as it can support limited formats of data and information types. While medical records comprise much more than just text, images, and videos, to integrate more functionalities EHR will come up and more complex systems. They will also become more cumbersome to manage. Blockchain-based EHR would be easy to manage and user-friendly some to manage as well as use. DApps have already become the latest trend for developers. If each hospital connects with the chain system of supply to demand involving each stakeholder in the ecosystem, it would solve the interoperability issue in EHR based systems. A DApp helps to achieve this. Blockchain application provides access to all stakeholders in the system in real-time with no restrictions in data types across the network. Ledgers with smart contracts following data sharing protocols for each stakeholder in the healthcare supply chain, including patients, medical practitioners, researchers medical suppliers and administrators will ease out operation bottlenecks massively. Blockchain technology is the forerunner in handling security threats. With increasing loads of data in EHR, managing privacy have become a critical task for hospitals. Furthermore, most EHRs are prone to hacking and cyber theft. Critical medical information, research data, falling into wrong hands can do massive damage. It can affect, patients as well as healthcare providers. Against this backdrop, decentralized applications based on blockchain can solve the issue. There is no probability of data theft and privacy infringement in blockchain based systems. The complicated workflow of EHRs makes them confusing. This is per Matthew Ernst from Jefferson University. He believes, existing EHRs can get staff “overwhelmed”, turning down their productivity levels. There are reports of considerable dissatisfaction at EHR. Existing systems are not user-friendly. Using blockchain based systems can develop simple and plain interfaces without much technical complexity. Such systems can fulfill the objectives of information sharing with limited or total access bypassing even the cost of hectic management. Conventional EHR systems hit the roadblock with limited technology. Using blockchain as the underlying technology, the ecosystem will have a relevant and useful facelift. Blockchain is being adopted in major industries like finance, advertisement, and supply chain management breaking with grand outcomes. Healthcare industry will reap the benefits of this disruption soon.